While there are many uncontrollable factors in your overall health, through good lifestyle habits and proactive health care, you can have significant influence over your physical well-being. Proper nutrition, exercise, rest and stress management are fairly self-explanatory. Much less concern is generally shown for practices that assist in minimizing toxic load, however that does not make them any less important. Your health truly manifests itself from the inside out; proper functioning of your vital organs and minimizing toxic load can influence your health as much as any other controllable factor. Are you in need of a jumpstart to your health or weight loss program? This is a incredible system that I recommend all clients start with before beginning any type of weight loss or get fit program. This is 30 day do-it-yourself system that will improve where you are with health in many wonderful ways to allow your body to function better as a whole. This system uses all natural, safe, whole food and essential oils based products from a high quality brand I use myself daily. The system has 3 phases (10 days each) focused on ACTIVATE - RESET - RENEW plus a food guide to follow along with it so you can learn how to eat properly, lose that extra weight and feel better overall. WHAT COMES WITH THE CLEANSE & RESTORE KIT? 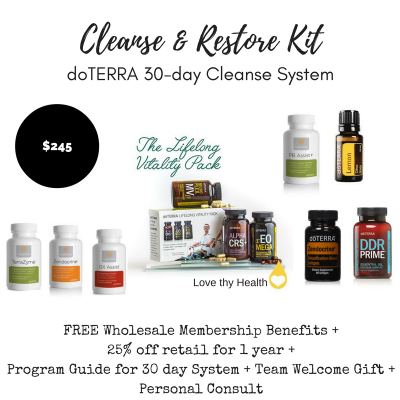 Cleanse and Restore comes with doTERRA's Lifelong Vitality Supplements, GX Assist, PB Assist, Zendocrine Complex, Zendocrine Softgels, DDR Prime Softgels and 15mL Lemon Oil which will be broken up by phases as mentioned above to get the proper nutrtion and fuel your body needs, gently cleanse and detoxify, rev up that digestion and metabolism all while supporting your body naturally. PLUS you will receive a 30 day guide on how to use your products, eat well and get your body to cleanse and reset from the inside out PLUS you will receive my personal support via email for any questions or concerns you have along the way! Additionally you will receive a doTERRA wholesale membership that simply allows you to purchase your products at 25% off retail for 1 year. No future purchase is required however we know you will LOVE your products and how they support you in your goals naturally. Step 2: Look for the email confirmation from doTERRA - this will confirm your order.